We hope you will love our photography and choose us. Do not compromise on quality; wedding photography is one of the most demanding and technical subjects to capture effectively. A good rapport with clients and effective time management are crucial. Commence your search asap. We are fortunate to be booked up to 2 years in advance. Review a few websites to get an idea of the styles of photography. Make appointments with a handful of your favourite photographers and arrange face-to-face visits. Be clear on the cost of your photographs. What is included in the price and how much will further reproductions cost? Call us on 07854 893 423. We average over 1000 edited highlights on a full-day wedding shoot, as a lasting memory of your special day (dependent on nature of event and conditions). We are renowned for offering the highest quality photography and competitive pricing. We have a range of packages to suit your budget, including image-only and bespoke hand-crafted Italian designer albums. How long on the day? Generally, we are with you from bridal preparations to the first dance, that way we can portray the entire wedding story in a beautiful fine art wedding book, a family heirloom to treasure forever. Numerous portfolios are available to demonstrate our consistent professional approach. In the main, we have selected the photographs, though you may wish to make some minor changes to suit your preferences. No models have been used. You are welcome to meet us in person, to view our professionalism and high quality of workmanship. Please view the gallery for highlights from various wedding celebrations. Tailored Service and Bespoke albums? Yes, all wedding books are tailored to your requirements. They include our unique stunning designs, beautiful artistic enhancements, colour, monochrome, dual tone, vignetting and borders. We select the best photographs from your wedding day, though you may wish to make some minor changes. You have a choice as to the album style, cover, page volume, page thickness, print and paper type. Our albums are hand-crafted in Italy using the highest quality materials and finish. We carry a full supplement of back-up equipment. Professional CompactFlash and SD cards are used simultaneously to capture your images. The cards are backed up to 2 hard drives and then provided to you on a USB drive. Yes, Matthew Paul is covered by public liability and professional indemnity. Matthew and Louise usually both attend each wedding and photograph. When was Matthew Paul Photography established? What qualifications and accreditations does the principal photographer have? Bachelor of Science degree (Honors) and a Diploma in Professional Photography. Accredited by the Institute of Professional Photography. Associate member of the SWPP, the Society of Wedding and Portrait Photographers. Canon professional DSLRs, L series lenses, ultra wide-angle to maximum telephoto range, including macro. These produce pin sharp images and offer superb flexibility for optimum creativity. Digital retouching is used to further enhance your photographs. 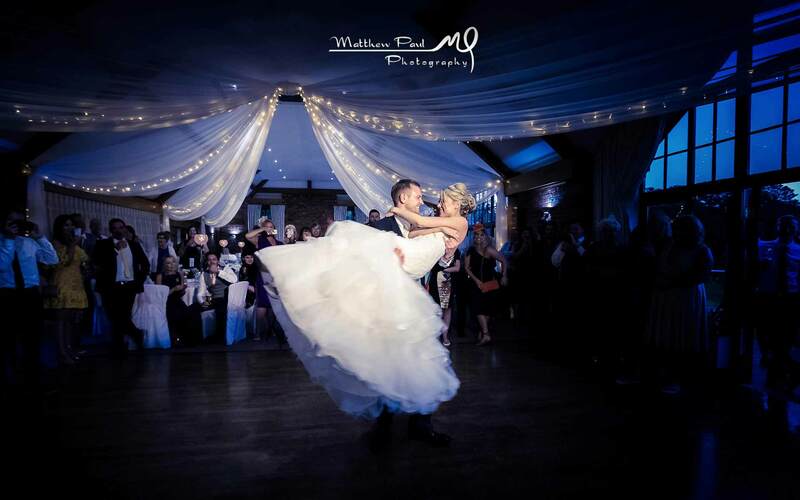 Your personal details will be kept on file by Matthew Paul Photography to ensure excellent service. Your personal details will be kept securely and will not be passed on to any third party. Matthew and Louise are both Disclosure and Barring Service (DBS) checked to an enhanced level. £500 deposit upon signing the contract to secure your wedding date. 2nd deposit of £500 one month in advance of your wedding date. Final payment due 7 days prior to your wedding. Limited copyright ownership of the resulting images can be permitted to the clients. Travel expenses beyond a 20-mile radius and any accommodation required will be arranged prior to the wedding and an additional charge made. No other professional photographers present, except those present for Matthew Paul Photography. Amateur photographers welcome. In the event of a downpour we will seek to take photographs under shelter with the most aesthetic backgrounds available. We also have a stock of umbrellas.